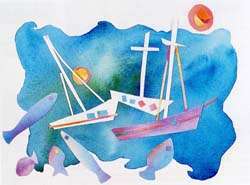 This painted paper assemblage recalls the fish, sailboats and sea of the island of Corsica. The background blanket is painted in turquoises and blues—brilliant Mediterranean colors. I made this painted paper collage while on a ferry ride from Corsica to Nice. Out came my scissors, glue stick and a lot of memories of a week in Corsica. 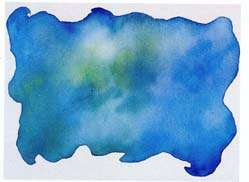 Choose your subject and paint a colorful watercolor wash on watercolor paper - you will use this paper later for your "cutouts." 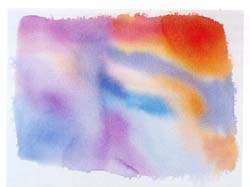 Paint a "background blanket" of a single color on a separate piece of watercolor paper. Think of this as a blanket of color on which you will eventually place your cutouts. 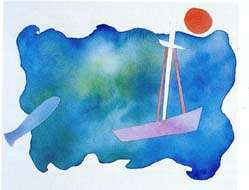 Use the paper from Step 1 to cut out shapes - houses, boats, flowers, whatever scene you'd like to describe. Using a glue stick, glue your cutouts to the "background blanket." These images can be used as cards, framed as paintings, or simply included as private art in your sketchbook.